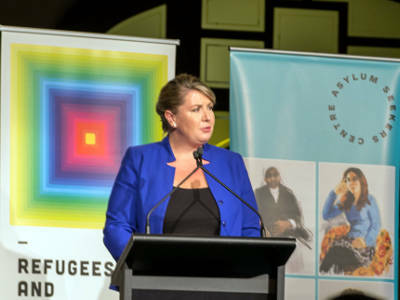 Our celebration of Refugee Week 2016, ‘Speaking of Freedom’, was a sell out event, with 700 guests in attendance at Lower Town Hall on the 22 June in support of the positive contributions made by asylum seekers and refugees to Australian society. 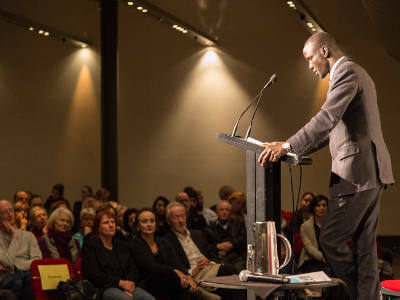 The Asylum Seekers Centre and the City of Sydney’s evening event was hosted brilliantly by ABC journalist Julia Baird, with guest speakers including Dr Peter Young, lawyer Deng Adut, Sarah Coleman and Desire Ndisabiye from St Vincents Private Hospital and ASC Patron and former Secretary, Department of Immigration and Ethnic Affairs, John Menadue AO. 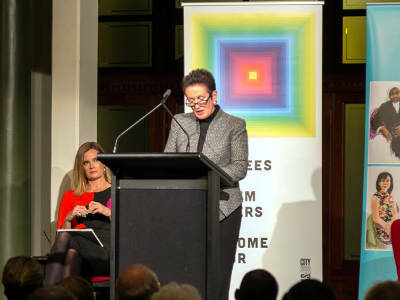 Both our CEO, Frances Rush and the City of Sydney Lord Mayor Clover Moore also presented on the night. Sudanese child soldier-turned-internationally renowned lawyer Deng Adut, gave a riveting 15 minute presentation, eloquently addressing amongst other things asylum seeker and refugee myths and misperceptions. 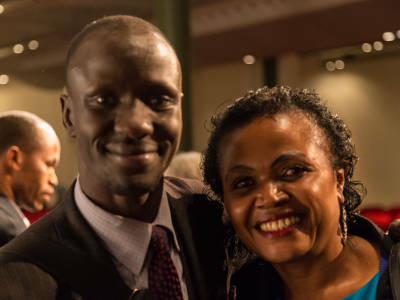 Deng Adut touched hearts late last year, when a short video telling his life story went viral. 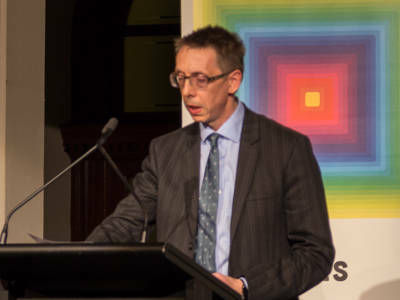 Dr Young, a consultant psychiatrist and former Medical Director of Mental Health for Australia’s detention centres between 2011-2013, gave a gripping speech. Dr Young’s full speech (click here) highlighted the fundamental conflict of interest, between professional and ethical obligations, that exists for health professionals working in the detention system, and especially those on the front-line. Dr Young has recently been in the news after it was disclosed that the Australian police had accessed Dr Young’s phone records because of his criticism of the country’s asylum seeker policies. Read more about this story at Guardian Australia. Other highlights of the night included talks from Sarah Coleman and Desire Ndisabiye who both work at St Vincent’s Private Hospital, Sarah as the Workforce Planning and Development Manager and Desire as a health professional. Both spoke about the plight of refugees and the freedom to work in Australia. St Vincent’s Private Hospital Sydney supports the Asylum Seekers Centre as part of their mission and is one of our key employment partners. 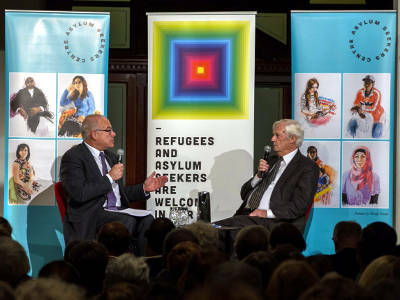 There was further lively and engaging debate during the night when John Menadue AO sat in conversation with Steven Glass to discuss issues facing asylum seekers in Australia and internationally. Steven Glass, is an ASC Board member, a Partner in the law firm Gilbert + Tobin and the firm’s pro bono refugee lead. 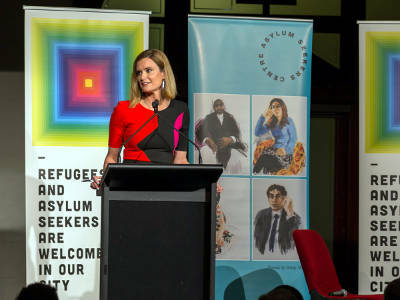 Speaking of Freedom was a huge success and all the speakers were a testament to the enriching contribution that refugees and asylum seekers can and do make to our communities, if they are given the respect and dignity needed to restore their humanity in their adoptive country.